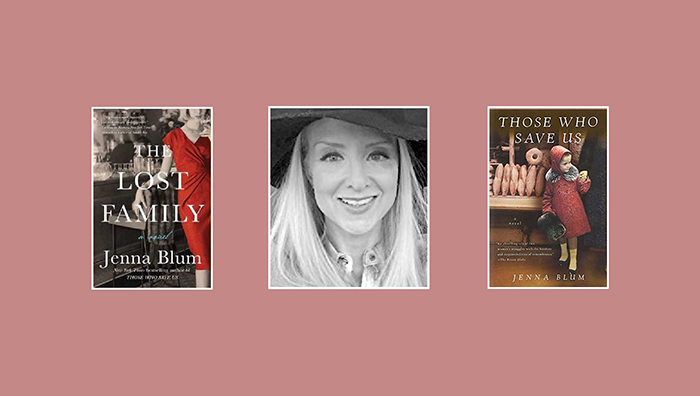 Jenna Blum, New York Times and international bestselling author of Those Who Save Us, and coming this summer, The Lost Family. Note from Susan McBeth: Several years ago when hosting Jenna Blum for an Adventure by the Book® event in San Diego, she shared her story with me of how she climbed from unknown debut novelist to internationally bestselling author, one book club at a time. This story planted the seed in my head that eventually led to the founding of NovelNetwork™, so I am honored to feature her as my first guest author. The story behind the inspiration will unveil itself in the Q&A below. SM: Why is it so important for authors to connect with book clubs? JB: I absolutely love talking to book clubs because it’s a chance for me to connect with real people after having spent so much time making imaginary ones come alive. There’s no better feeling for a writer than to hear readers animatedly discussing your characters and why they did this or that—-and also there’s usually wine! Seriously, it’s such a privilege to hear people talking about your work and be able to provide behind-the-scenes answers to their questions, and readers’ perspectives and comments are inspiring to me as I write more books. SM: In the alternative, what do you think book clubs get out of visiting with authors? Isn’t the point of a book to encourage readers to interpret it in their own way, so why do they need to talk to the author about it? JB: That’s a great question! I admit to wondering the same thing when I first started visiting book clubs: I thought, isn’t reading the book the main thing? But I instantly learned that readers love to have behind-the-curtain access to writers, to ask “Why did you choose not to have quotation marks?” or “Why did this character leave? Why didn’t this character ever talk to her daughter?” The book belongs to everyone so we can all draw our individual conclusions, but I think readers like to hear the authorial perspective and compare it to their own ideas about the novel. SM: What has your personal experience been like in meeting book clubs? JB: My experience has been utterly blissful. Readers welcome me into their homes, share their food, wine, and families with me, then discuss my characters as if they were real people sitting in the room with us. What a joy! Every single book club I’ve gone to, I’ve left saying, “Thank you, thank you!” and whispering an extra prayer of gratitude in my car. That’s a lot of wonderful memories, because I attended over 800 book clubs in the Boston area alone—and that was just for my first novel, Those Who Save Us. Now that I’ve written two novels and a novella, I’d estimate I’ve been blessed to speak with at least a couple of thousand book clubs. That’s serious accumulation of good feeling, literary discussion, baked goods, and wine. And connection. SM: How much time have you personally spent video chatting or visiting book clubs in person? JB: When I’m actively promoting a novel, I estimate I speak to at least 3 or 4 book clubs a week, whether in person (which is usually a 4-hour endeavor, including transportation) or via Skype, Facetime, Google Hangout… I’m not very good at math, but I’d say at least 20 – 30 hours a week, in addition to my larger speaking engagements and tour events. SM: Now that you are an internationally and New York Times bestselling author, what have you learned and what has changed in your thinking about visiting with book clubs since you were a debut novelist? JB: I’ve learned that book clubs are the gold standard of readers for writers and publishers alike. Those Who Save Us, my first novel, jumped onto the New York Times bestseller list in 2008 in large part because of book clubs. I’ll never forget when this happened: I was on my way to a book club!, in Newton, MA, when I got a last-minute email with a PDF attached. The attachment turned out to be the NYT bestseller list for the following Sunday—and Those Who Save Us was on it!, debuting at # 18. I called my agent and said, “Who would play such a mean practical joke on me?” My agent, who is French and has a voice like a Judith Krantz heroine at the best of times, developed a distinct purr as she said, “It is no joke. All my colleagues want to know how your book got onto the New York Times list two years after it came out in paperback. What is your secret? They are calling you Seabiscuit.” Once I parsed the fact that my name had become synonymous in New York publishing circles with the horse who had come from behind, I said, “There is no secret; I just have really, really good readers.” And they were and are—as I knew from, at that point, visiting three book clubs a day, in person. Book club readers are the most dedicated around. They take reading seriously, as do I, and they love their books. They passed Those Who Save Us from hand to hand, mother to daughter, sister to sister, friend to friend. To this day every writer and publisher I meet asks, “How did you get in contact with all these book clubs?” At the time: word of mouth….and just really, really good readers. SM: Can you explain to readers how the publishing industry works in terms of sending an author on book tour, and what the expectation is that authors will do themselves to promote their own books? JB: Sure! It used to be that when you published a hardcover, you’d automatically go on a tour that included several major cities, and readers would come see you at bookstores—because that was the only point of connection between readers and writers. I used to write letters—remember letters?—to my favorite authors care of their publisher! “Dear Random House….” Now, since the incursion of digital publishing and social media, the points of connection are more numerous but also more diffuse. This means the publisher might send an author on a tour, but more likely, the author will do an online tour, blog tour, and a couple of in-person events, then work on her own to promote her book: to advertise on social media, hire a publicist, think of out-of-the-box to create events that readers will enjoy—and to try to reach book clubs, which is where the readers are. That’s why an author being able to connect with book clubs is so crucial: we don’t have the guaranteed book tour or venues we used to. We have more agency, but we have to find you or you us! SM: I noticed that in no other occupation is a professional expected to visit with their fans. For example, a professional athlete expects that fans will purchase a (rather expensive) ticket to a sports game, yet not only would they would never consider visiting a fan’s home for free to chat with them; a fan would never consider asking. Yet when a reader buys a book (for much less than a sports ticket), they give no thought to contacting the author and asking for a video chat or personal visit, with no expectation of paying for the author’s time. Why do you think that is? JB: I suspect it has to do with the same concern I had before I started asking for a book club honorarium. It’s such a privilege to be able to connect with people who’ve read your book, made it part of their lives—why wouldn’t I want to give them as much of myself as possible? But about halfway through my jaunt of speaking to three book clubs a day—which was a 12-hour day—I visited with a friend who’s the only female CEO I know, and she said, “Why aren’t you being paid to speak to book clubs?” I said: “Because they’re already buying the book.” She said: “And then they get the story—they get a product, they get an object, they get art. What you provide during your visits is the story-behind-the-story, which is different.” When I thought about that, and I totaled my hours in a clear and objective way, I realized that as much as I adore speaking about my books, every hour I do this is an hour I’m spending not writing a new book. As a businesswoman and entrepreneur—I’m the head of my own company, jennablum.com—I realized my friend might be right that the book is a product and my visit is a service. I now ask an honorarium to speak at book clubs—about the price, for each member, of a movie in a theater. Then I try my damndest to be as entertaining as a movie. SM: And in follow-up to that question, do you think that as many male authors are asked, or expected, to visit with book clubs as female authors? Why or why not? JB: That’s an excellent question, and to be honest, I’m not sure. I know that most of the book clubs I’ve been to have been comprised of women—with the exception of a husband who sneaks in through the garage, calls, “Is the book club still there?” and hastens up the stairs. Once in a while, the brave rooster hangs out with us in the henhouse! Given this atmosphere, it may be more of a cozy thing for female authors to attend book clubs than male authors, but I could be completely wrong about that, and I’m sure my male colleagues would love to attend. SM: Working in the industry, I frankly find it kind of shocking what authors are expected to do and what costs they are expected to absorb in terms of marketing their own book. When did the industry lose its author-centric focus, and why? JB: I’m not sure the industry is no longer author-centric: I know publishers highly value their writers. But to your point, in the past two decades of my having been a published writer, I’ve seen writers (including myself!) assume the financial responsibility for, for instance, paying for Facebook promotions and independent publicists beyond what the publisher provides; launch parties; author photos; travel expenses to speaking engagements beyond their tours (if there is a tour); websites—and many other things. This is no complaint—publishers love their authors, and they publish a lot of books per quarter, and we are all still scrambling trying to figure out what the shift to e-books means and how to best reach and please our readers. I do try to let writers know, when they’re about to be published, that they should budget for these necessary expenses, and I’m sure many readers have no idea that we do a lot of our promotion out of pocket. SM: As a reader, I would have no problem paying a reasonable fee for an author to visit my book club, because I know their time is just as valuable as mine. Yet, this is not the industry norm, so what do you think it will take to get readers, and the industry in general, to understand this? JB: As with most things in life, the more we talk and demystify, the more honest we are, the better our chances of being understood. I don’t want to go to readers hat in hand and say “Poor me, I have expenses, give me money”—because we all have expenses. But I do think there’s a lot of unnecessary mystery around the business of writing—and that includes for writers themselves!—and the more we talk about finances, especially as women, the more empowered we are. I’m a little uneasy even being up front about the fact that the creative side of writing is sheer magic, and meeting readers who’ve read my books is a miracle—and getting the books out there is a business. I wasn’t raised or trained to talk about money. But if we don’t, the obfuscation remains, and I became a writer in part to attain clarity. The past few years have taught me I like talking business, and I hope my readers find it as illuminating as I do! SM: In closing, what message do you want to leave for your readers. JB: I’m so, so grateful to you for buying and reading my novels, and I’m so looking forward to talking with you about the new one, The Lost Family (Harper Collins, June 5th!) Happy, happy reading! Love, Jenna.